YingYing and I took a bus from Hangzhou to Yizheng. 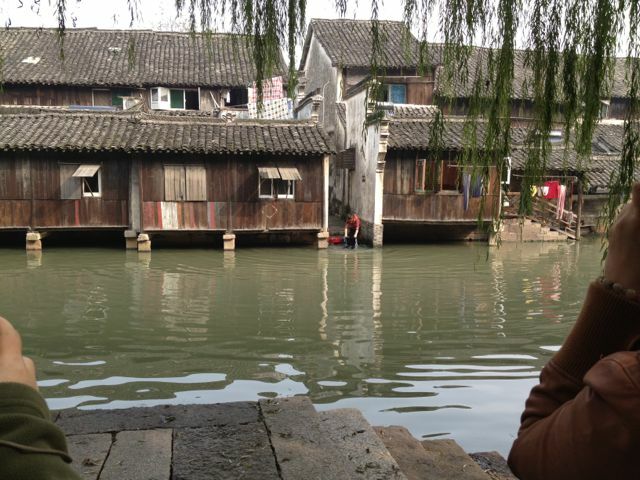 It is an old fishing village built on a canal. Saw a woman washing laundry in the canal. (photo) the whole place had old decrepit houses and small museums. It was fascinating. There is a more modern part to Yizheng also, but frankly I found the old part to be very interesting. Upon returning to Shanghai at 3:00 we went to a pretty, yuppie shopping area and ate in the DinTai Fung dumpling restaurant. It was delicious but I ate too much!